As producer of talk shows hosted and executive-produced by Barry Gordon, I worked with him to develop media kits and packages for potential sponsors and syndicators. Accompanying each kit or package was a demo of the show, delivered in a suitable format: either an e-mail containing a link to an online audio or video file, or a disc containing one or more audio or video files and sent through the mail or delivered in person. A link could lead to a demo online: an audio file containing selections from Barry’s interviews on the Left Field radio show. I selected and edited together these brief audio clips, of Barry talking with bestselling authors Ron Suskind and Gore Vidal, former U.S. Secretary of Labor Robert Reich, and Rep. John Conyers Jr.
A link could lead to an audio file containing an entire, three-hour radio show in the archives I created for the Left Field Web site. There are links to click for either streaming — which are actually links to “m3u playlists” for mp3 audio files — or downloading — links directly to mp3 files (After an mp3 file has been downloaded to your computer, you can open it with your media player and jump to whatever portion you’d like, without having to listen to the entire show from beginning to end, as you have to do with online streaming). Note that the archives I created contain over a year’s worth of three-hour radio shows, indexed by guest and by date and searchable by keywords in the summaries I wrote to accompany the audio for each show. A link could lead to a Web page with a Flash video recording in NewsRapArchives.com, the Web site I created for the episodes I co-produced of the one-hour cable TV talk show. 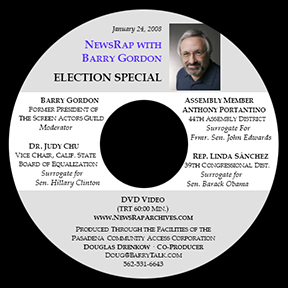 The episode that we usually featured was our 2008 Election Special, with Congresswoman Linda Sánchez and other special guests. Note that the shows were originally recorded on DVDs or digital video tape; if the latter, the studio would transfer the show to a DVD. I “ripped” each show from the DVD and converted it to a Flash video file, which I embedded in a Web page, thus allowing the show to be “streamed” (actually, “progressively downloaded”) by over 98% of the world’s computers online. An audio CD could contain a brief audio demo or a one-hour radio interview. An audio DVD could contain several one-hour interviews or an entire three-hour radio program. A video DVD could contain selections from or the entire content of a one-hour television program.